Who’s ready for the most un-fancy meal ever!? aka…the perfect Thursday night football meal!! 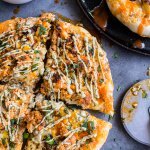 I guess this might technically be an appetizer, but over here, this Cheesy Buffalo Chicken French Bread was served as dinner, and not gonna lie, it was by far one of my family’s favorites that I’ve made in the last few months. Seems so, like simple, but my family loves, loves, loves anything with buffalo sauce. Way back in the day…ok, like three or four years ago, I was making buffalo chicken for the family at least once a week. It was a go-to meal because literally everyone in the house would eat it (well Asher was little, she hasn’t come to appreciate buffalo sauce quite yet). Mom, dad, brothers… they all just love buffalo sauce. They even dig the blue cheese I like to add. 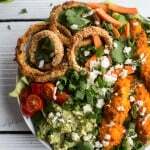 Since starting the blog, I’ve moved away from making weekly buffalo chicken and on to things like tomato tarts, steak bowls, salmon bowls and french onion pasta. I’d say it was a good thing, but my brothers will highly disagree. Anyway, my point is that the other week when thinking about a recipe for the start of football season, the thought of buffalo chicken obviously came to mind. I guess I figured since I literally had not made it in months, that I’d try out this fun new recipe. 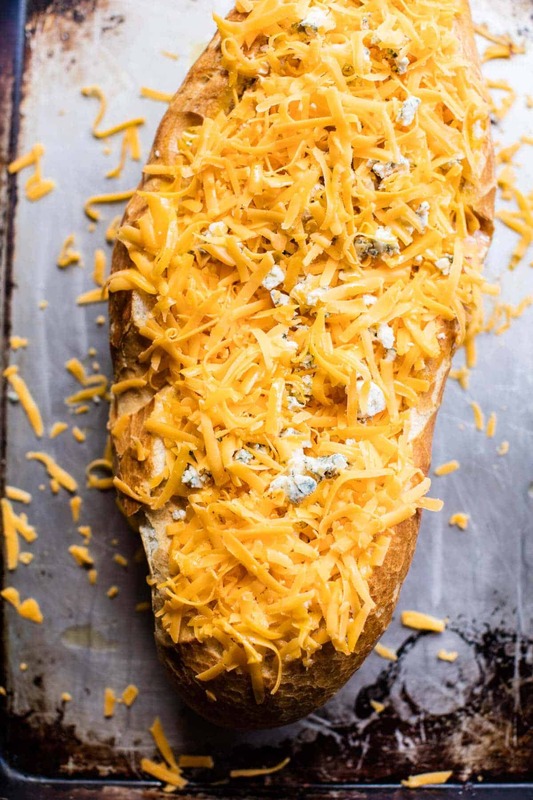 I mean, how could french bread stuffed with buffalo chicken and cheddar cheese not be beyond delicious?! It might be simple American flavors, but man it is SO GOOD. You can all thank my brother Malachi for this recipe. If it was not for his little nudge to make this, you probably wouldn’t be seeing it today. I’m going to be honest, at first I wasn’t sure if everyone in the world was just so over buffalo chicken, but then Kai convinced me, that is not even possible, so I just went with it. So glad I did because like I said, this is delicious! Nothing not to love. Alright, so here’s how this works. …take your french bread and remove the top, make a little room for your buffalo chicken filling. …now take the bread scraps and turn them into garlic parmesan bread crumbs. YUM. 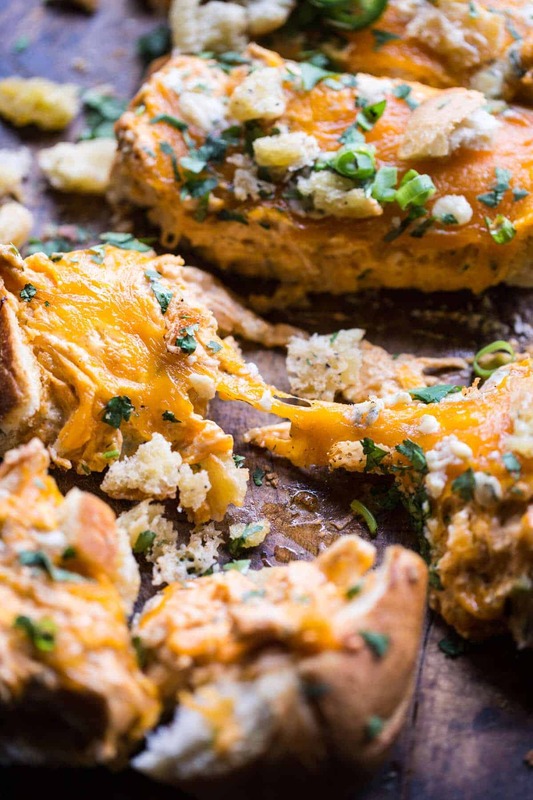 …mix your buffalo sauce, chicken and cheese. …stuff that into your french bread. …bake until golden and melty. 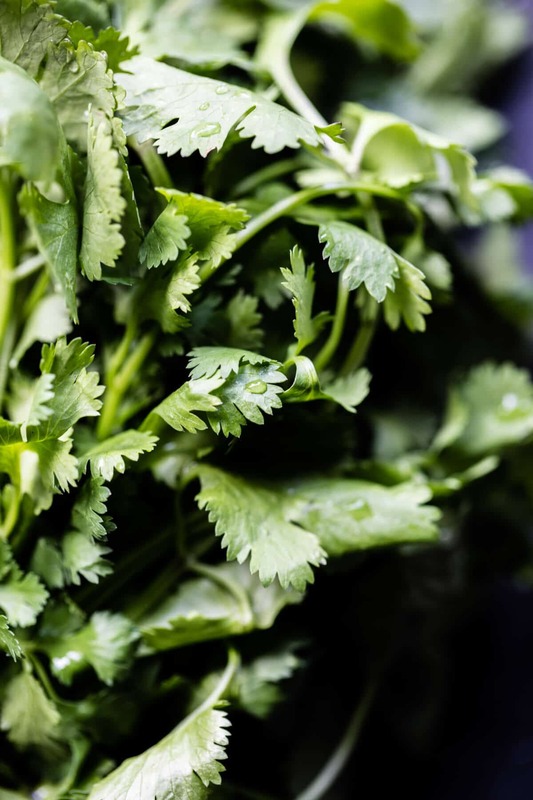 … top with bread crumbs, cilantro, jalapeno + green onions (if you want!). …drizzle with more buffalo sauce, never enough buffalo sauce. For real though, does that not sound like dream football food??? Pretty perfect for today, right? And guys, even if you’re not into football at all, this is still the most perfect dinner for tonight. It’s fast and simple and loved by pretty much everyone. 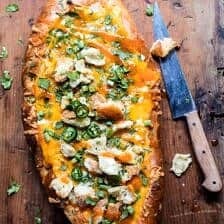 Cheesy Buffalo Chicken French Bread from Half Baked Harvest on Vimeo. 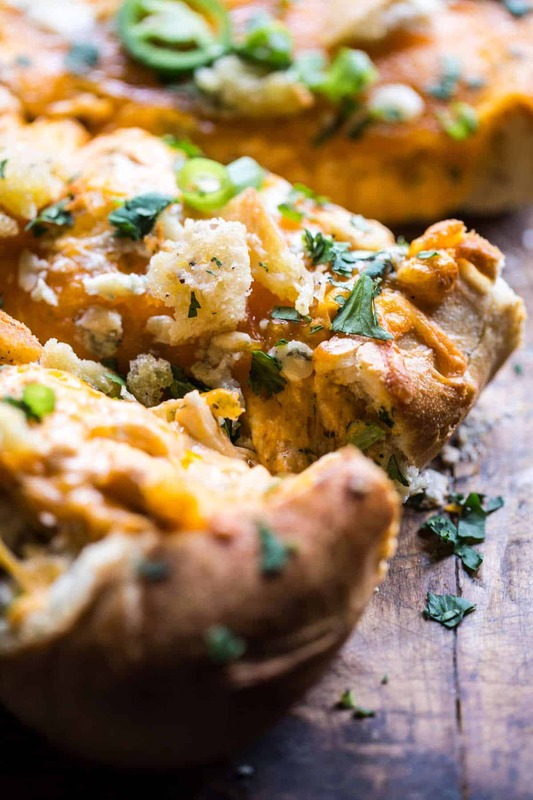 Cheesy Buffalo Chicken Stuffed French Bread. Take your french bread and place it on a rimmed baking sheet. Remove the top 1/3 of the bread and then pull out some of the insides to create a space for the chicken filling. Just be careful not to remove all of the bread, you want a thick layer of bread for your boat. Rub the inside of your french bread with olive oil and sprinkle with salt + pepper. Now grab the scraps of bread and tear them into pieces. Toss with 2 tablespoons olive oil, the garlic, parmesan, salt and pepper. Place both the french bread and the bread scraps in the oven. Bake for 8-10 minutes or until the breadcrumbs are toasted. Remove everything from the oven. In a medium mixing bowl, beat together the cream cheese, ranch dressing, buffalo sauce and paprika until combined. Stir in the chicken, half the cheddar cheese, and all of the blue cheese. Gently spread the filling into the french bread in an even layer. Top with the remaining cheddar cheese. Bake for 20-25 minutes or until the cheese has melted and the filling is warmed throughout. Remove and top with the breadcrumbs, cilantro, jalapeños and green onions. Serve with more buffalo sauce and ranch if desired. Eat! *To make shredded chicken: Preheat the oven to 375 degrees F. Place the 1 pound boneless, skinless chicken breast in a roasting pan and drizzle lightly with olive oil. Season with salt + pepper. Bake for 25-30 minutes or until the chicken is cooked through. Once cooked, allow the chicken to cool and then shred with your hands or two forks. 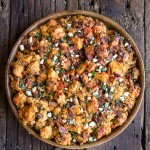 **Inspired by [Carlsbad Cravings | http://www.carlsbadcravings.com/buffalo-chicken-dip-recipe/]. Hip, hip for the start of fall football, and more importantly…fall football eats + drinks. YES! 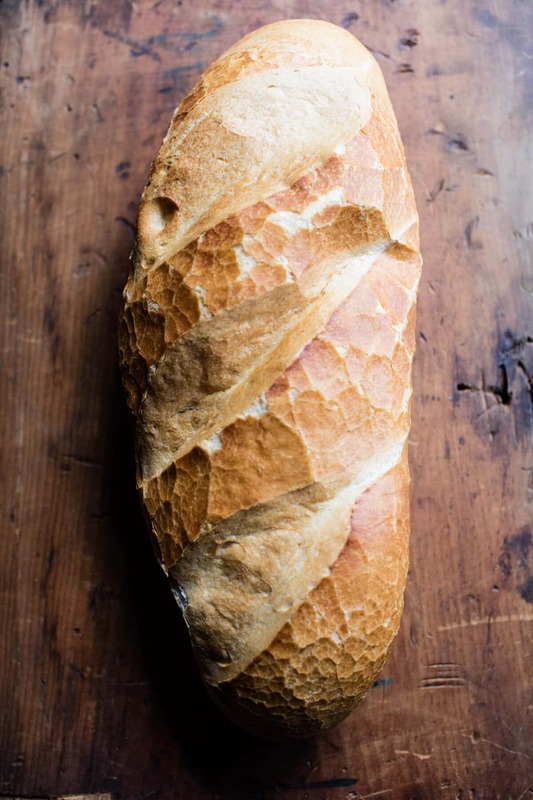 Thanks to the Bros for this beautiful, simple, and ridiculously-looks good french bread! We LOVE buffalo as well. Whoever invented it deserves a finger-lickin good high five! Lol Great job as usual, T! ? Right?! It is so good! Thanks so much Sheila! Oh I would totally eat this. Never tried buffalo sauce ever, but I don’t care, I would eat this and I’m sure I would want to eat it and eat it and eat it 😉 it looks THAT yummy! 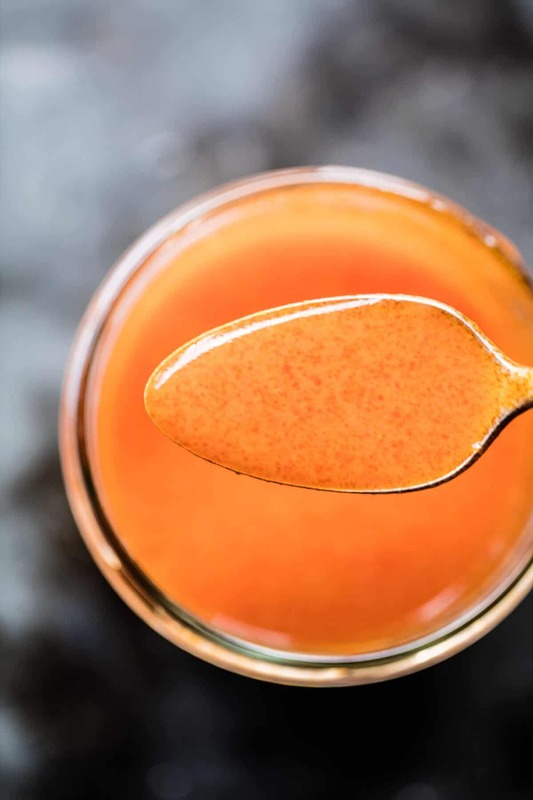 I am sure you will love buffalo sauce!! Haha, anyway I hope you love the recipe! Thanks Miranda! Wow, this sounds AMAZING, I love buffalo sauce, nomnomnom! I hope you love this just as much haha! Thank you! ? Need try all that cheesy goodness. YES! Please do, I hope you love it Nancy! Thanks! May I have that for breakfast, right now? WOW!! Does that ever look good! I have to say that would be perfect any time of day. YUM! Haha I am sure my brother would have to agree! Thanks so much Marisa! this looks SO easy and craaazy delicious, I’m obsessed!!! YES! I hope you love it, thanks Christine! wow. I literally love anything with a buffalo sauce on it! That bread looks like the perfect bread to hold such a beautiful concoction! Haha thank you so much Jessica! I hope you love this recipe if you get a chance to try it! ? YES! This is perfect for that, especially for an appetizer with some friends! Thanks so much Erika! I am excited you are enjoying this recipe Aimee! Thank you! I wish you had told us how you make the “buffalo sauce.” Hot sauce + butter? But how much of each? HI Stephanie! I do 1 stick butter to 1/2 cup hot sauce + 1/2 teaspoon seasoned salt. Let me know if you have questions, Thanks! This sounds so good! Definitely dinner material for me! Awesome!! I hope you love it Amanda! Thanks! ? This looks freaking amazing! My mouth is seriously watering and in this moment I’m really wishing that my coffee would turn into buffalo sauce. Yum, yum, yum! Haha! Thanks so much Jessica, I hope you love this if you get a chance to try it! Yum, that looks to be just about perfect for Saturday football games, a great suggestion for this weekend. Agreed! It would be awesome for football games! Thanks Charlie! Girl. I must know your secret. Is this really all natural beautiful Colorado sunshine in your photos or are you using some amazing light set up?! Either way you have fooled me so hats off! Oh my gosh! Before I even read the first line of your post I was thinking this is the perfect football watching food! Will definitely being giving it a try for our football crazy crew soon! Great idea!! YES! I hope you and all of your crew enjoy it!! Thanks Maria! 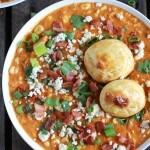 Literally drooling over here, this looks fantastic Tieghan! Made this for our ‘housewarming’ party with a few friends. It was REALLY good but very difficult to cut because the insides were all slumpy! I ended up scooping all the slump up and putting it in a bowl for scooping with chips. 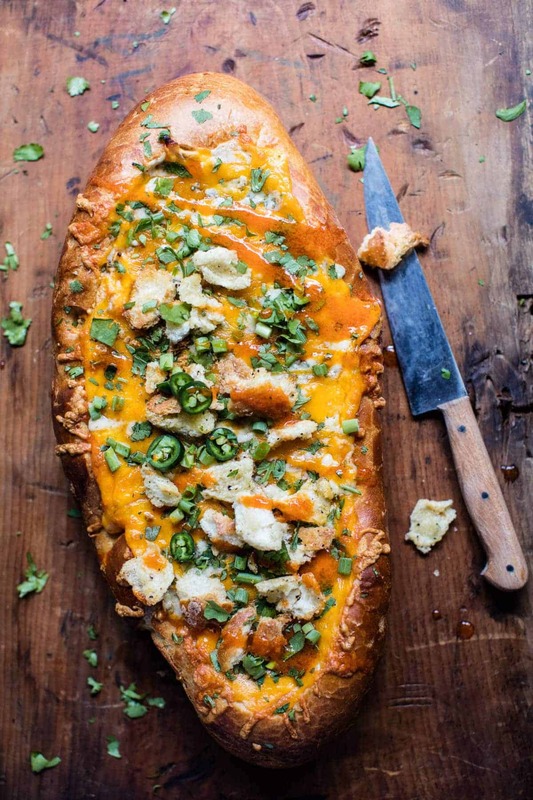 Love the idea of putting buffalo chicken dip inside a bread boat! Oh what a great idea!! I am happy you enjoyed it too! Thanks Emily!! Thank you, hope you love it!